Musée Héritage Museum: Happy National Aboriginal Day! In honour of National Aboriginal Day, we thought to blog on some of the Métis beadwork in our museum collection. St. Albert is fortunate to have access to some exceptional examples of Métis beadwork. 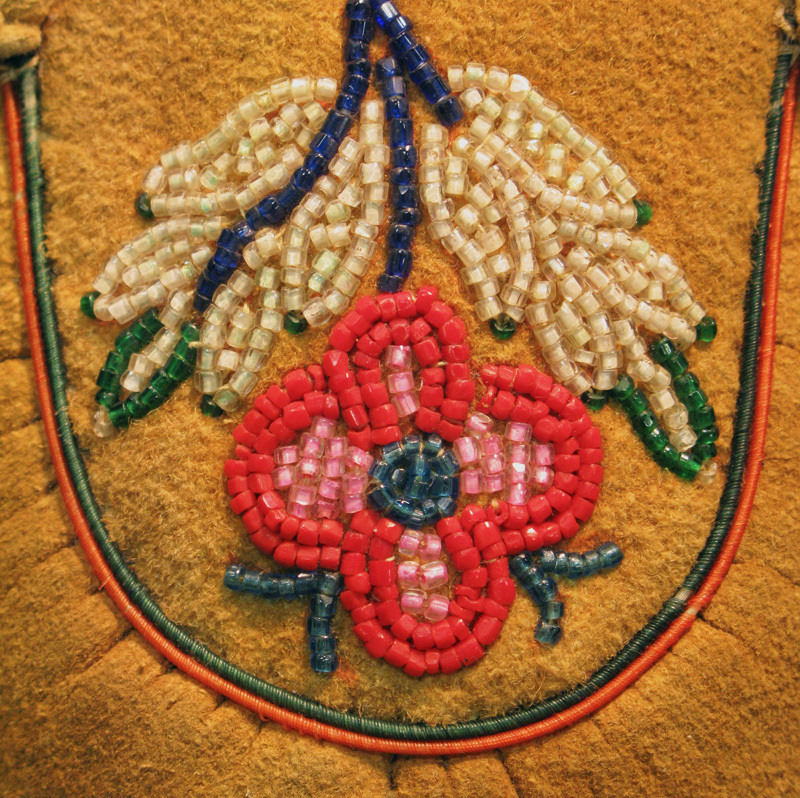 Métis beadwork was identified by highly decorative floral designs; in fact, the Dakota Sioux and Cree called the Métis the “Flower Beadwork People”. 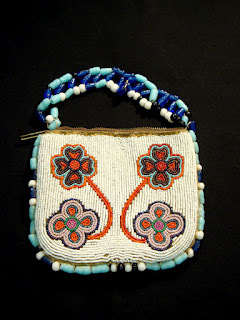 Métis adorned garments and personal items of all kinds with imaginative designs of brightly coloured and metallic beads. 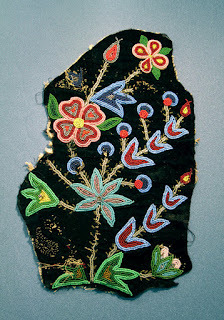 Occasionally, when Europeans began searching for items to collect, other cultural groups sold the highly desirable Métis work as their own, creating confusion as to the real source of the pieces. 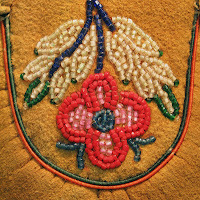 Beadwork designs have traditionally been shared, adapted and passed on from one individual to another and from one community to another. 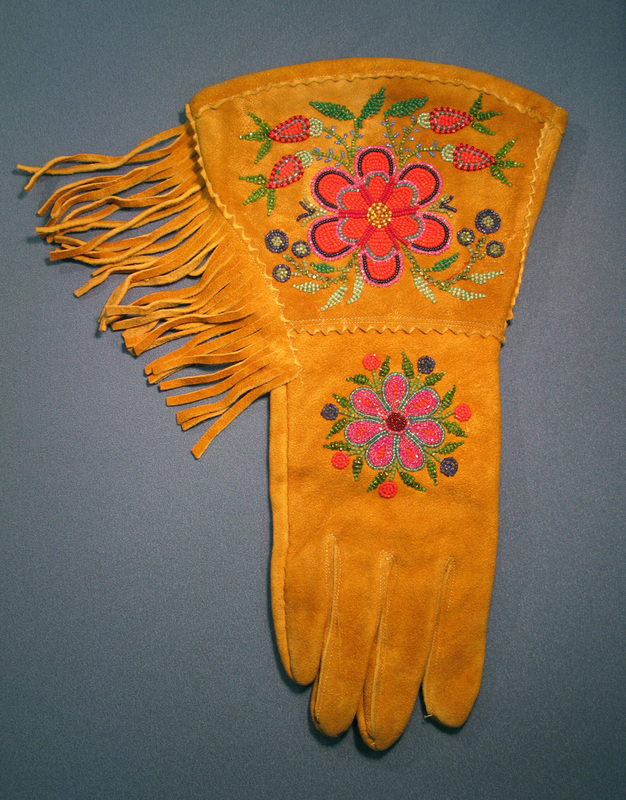 Women were inspired by each others work, incorporating new ideas not only from other beaded items but also from painted designs, porcupine quillwork, and even European embroidery. 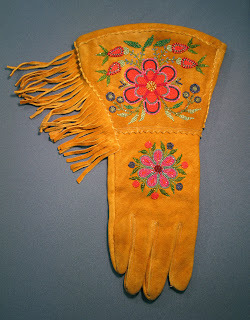 As patterns and techniques moved throughout the northwest it often became difficult to attribute a style to a particular culture or area. Pierre Gray was a well-known and very successful free trader near Grande Cache. In 1868 he married Marie Delorme. They adopted Mary Desjarlais along with four other children from the Lake Isle area. Mary was born ca. 1892 and was raised on the Gray’s farmstead at Lake Isle where Pierre and Marie ran a stopping place. The items made by her were likely produced in the hamlet of Marlboro, near Edson. The daughter of a Cree medicine woman, Victoria Belcourt was born in Lac Ste. Anne in November 1862, and was baptized by Father Albert Lacombe, OMI. She only attended school for a short time. As a young girl of thirteen, she took part in her first buffalo hunt in a traditional Red River cart. She later described the hunt and also her early years at Lac Ste. Anne. In 1879 Victoria married Louis Callihoo and together they had twelve children – six boys and six girls. Their household spoke both French and Cree. As with many supplies, fabric for the family’s clothing came from the Hudson’s Bay Company. The women of the family wore traditional leggings made of black velvet, which were beautifully beaded on the outside of the leg. As well as raising a family, Victoria and her husband hauled freight for the Hudson’s Bay Company between Edmonton and Athabasca Landing. Many of the Métis in this region made their living by transporting supplies. Women took part in all types of work to help bring in money and Victoria was able to use her skill as a horsewoman to help her family. Louis and Victoria also farmed, had a sawmill, and ran a hotel for a time. Louis Callihoo passed away in 1926. When Victoria got older, she moved away from Lac Saint Anne, but continued to attend the religious pilgrimage every year until she was 98 years old. Always an avid dancer, at the age of 100 she danced a Red River Jig at her birthday celebration. Victoria Callihoo was 104 when she died at the Youville Home in St. Albert. She credited her long life to the abstinence of alcohol and tobacco, combined with lots of exercise and as much fresh air as possible. The name is GRAY not GREY , it has never been GREY ,that is a misspelling. I want people to know that because this misspelling has caused a lot of trouble for those of us searching our roots. Our line of Grays originates in Scotland with John Gray born 1660 Ireland. His family immigrated from Scotland to Ireland about 1612. You are absolutely right. Thank you for bringing this to our attention. We apologize for the error. The change has been made and the name is correctly represented now.